Soda Lime Glass, also known as soda lime silicate glass, is one of several formulations of glass which is manufactured in a shape of a sphere. There is not one standard formula for soda lime glass. 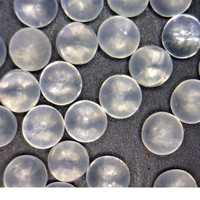 In general, soda lime glass spheres contain about 75mol% of silica (SiO2), 14%mol of sodium carbonate (Na2O), 10mol% of calcium carbonate (CaO) and small percentage of other additives. 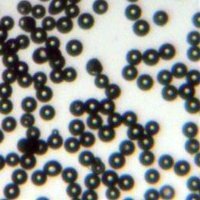 It is the most common type of solid glass microspheres available, offered in a wide selection of sizes and grades (precision, classified, bulk and spacer grades). 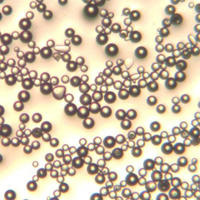 Soda Lime Glass Microspheres are based on the most common and economical formulation of glass. This is our largest product line with sphere diameters as low as 1micron and as high as 4mm. Precision polished solid soda lime glass particles with high sphericity and narrow particle size distribution for bondline spacing and other demanding applications. 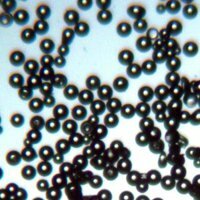 The optimized silver coating on solid glass particles provides the spheres with conductive and shielding properties. Precision Polished Grades of Soda Lime Solid Glass Spheres.